What are the hottest Spring fashions? There are many new wearable looks that you can incorporate into your wardrobe. Black and white mod patters are hot. Add a new top or mini-dress in this combination for a fun date night look. What about bright neon? Yes, some of us remember these colors from the 80s. No one wants you to wear head to toe neon, but a cute clutch or some bright sandals can add a little whimsy to your outfit. These are just a few of the 2013 Spring trends. What will you add to your closet? Be sure to check out Sears and Kmart for all the hottest trends. 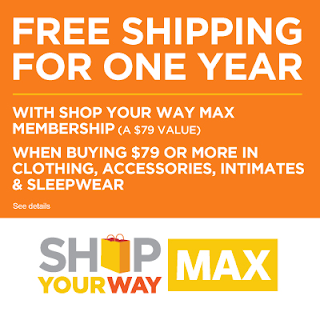 Plus, spend $79 or more on apparel, sleepwear, intimates or accessories and get Shop Your Way MAX Membership extended for a year. That means another year of FREE shipping. No more excuses for last year's clothes. Time to update your closet today.